Most Frequent Service Calls!! Outlets not working! This typically happens in bathrooms, kitchens and garages. Homeowners generally go to main panel and notice no breakers tripped and cannot understand why outlets dont work. The culprit is usually a Master GFI device tripped. Homeowners can generally fix the problem on there own instead of paying a qualified Mesa Electrician to fix it for them and charge them. All they need to do is push the button on the master GFI to re-set the circuit and allow power back to the outlets. How Does A GFI work. GFI stands for Ground Fault Interrupter. It interrupts a circuit if a Ground Fault exist. An electrician is a tradesman specializing in electrical wiring of buildings, and related equipment. Electricians may also specialize in wiring ships, airplanes and other mobile platforms. “Electrician” and “electrical contractor” are related terms. An electrician is an individual trades-person; an electrical contractor is a business that employs electricians to design, install and maintain electrical systems. In the United States, separate licensing requirements exist for electricians and electrical contractors. Electricians are not usually allowed to perform work for the public unless under the employment of an electrical contractor. This entry was posted in Electrcian Qualifications, Electrical, Electrical Contractor, Electrician, Uncategorized and tagged electrical contractor, electrical repair in Mesa, electrician, mesa electrician. Bookmark the permalink. This was very helpful and I am looking for a good electrician so I will probably give you guys a call, we are building a house and will need it wired to the proper specs. Thank you for posting this article because I was online shopping for one when I ran across this. Keep up the good work you guys do and great job advertising on the web. Thanks James. We’re happy to help! This was a very interesting article I didn’t know those things about electricians. I was going to be an electrician once and didn’t like the way I got shocked all the time. I was in a house once and they were doing the wiring and I kept hearing this guy on a ladder say “damn it and then he’d do it again a few seconds later, he was being shocked while installing it. Hi Robert. I wonder if the guy on the ladder is still an electrician? It pays to use a professional. We this has actually happened to me in my home. On a lecture call outlet in the bathroom with stopped working and I was afraid the problem would be more complicated than it actually was. Little bit I know of it was simply, a matter of resetting the circuit breaker the via the names switch. This information was very helpful. Thank you very much. Sometimes, it’s the simple things that just work! I did not to realize that it took so much training to be an electrician. For instance, to become licensed, an electrician must complete an apprenticeship with a licensed electrical contractor consisting of 8,000 hours of on-the-job training. After completion of the on-the-job training, electricians take the State’s licensing exam to be licensed as journey electricians. After two-years of related work experience, a journey electrician can take the State exam to become a master electrician. Yep. As an electrician, we deal with issues that affect the health and safety of you and your family. I have to say that electricians are crazy doing what they do. I have heard a guy get shocked while wiring a new house so many times that I thought for sure he was going to have a heart attack at any time. The electricity that goes through these guys sometimes can’t be good for their internal organs right? What about those that die from it? Electrocution is not fun…and not good for the organs. I have noticed that thousands of electrician jobs will be available to many people because this type of occupation is so important in construction with homes and buildings. It is a very needed profession all over. Electricians sometimes learn their trade through on the job training and also through formal training such as apprenticeship programs. Electricians certainly do make a decent salary. One tip I learned from my uncle is an easy way to test power on an outlet. To know if power has returned to dead outlets in one room when you are testing outlets or purposely disturbing connections in another, I have found a 120-volt buzzer out of an older smoke alarm can be heard across much of a house. Rig it to a short cord-and-plug and plug it in. I for one and glad that there are electricians out there these days because electrical problems are the most difficult to trouble shoot and locate. I tired in a car once and it was a nightmare so I can only imagine what it would be like for a house. Thank you for a job well done and a great job on this post as well. Keep up the good work. Ever have an occasion to use a hole saw to drill drywall? Drywall can really kill the teeth of a hole saw. But run your drill in reverse. It may take a couple more seconds to drill the hole, but the cutting edge of your saws’ teeth aren’t getting ruined by the abrasiveness of the drywall. I like this idea which I got from an electrician… but let me add a disclaimer about emphasizing safety. To pull wire smoothly with fish tape, I was taught to start by stripping an 8-in. length of cable. Using a side cutters, cut off all but one wire. Cut at a steep angle to avoid a “shoulder that could catch on something. Then bend the single wire around the loop on the end of the fish tape and wrap the whole works with electrical tape to form a smooth bundle. I appreciate having a qualified electrician available. Most states and municipalities require electricians to be licensed, and to obtain a license one must pass an exam that tests knowledge of electrical theory, the National Electrical Code and local electrical and building codes. So they really are qualified professionals just as much as a lawyer or accountant CPA and they cost a pretty penny, too. I grew up in the construction industry so I automatically knew about the GFI switch and what it was for but it still amazes me to this day how many men and women don’t know what it is or what it is for. I guess I assume because I do that everybody does but that is simply not the case. Thank you for posting this you explain it better than I do. A customer the other day thought their outdoor circuits were all bad…ended up being a simple GFI reset and the problem was solved. A GFI switch is in the line before the breaker to pop so they breaker doesn’t have to correct, kind of a surge protector? I am so excited to learn these things because my son is going to school to be an electrician and I can show him that I know some stuff about it as well. Thank you for taking the time to share this with us. You’re welcome Richard. Yes, the GFI is like a surge protector except it can save your life too. Common electrical problems in the home need to be on your watch list. Throughout the life of your home, you will no doubt come across issues with the plumbing, heating and electricity. Some issues can be solved by you, the homeowner; others are entirely out of your grasp because they relate to the city’s power issues. Issues also have varying degrees of danger: some can be hazardous and that’s when you call an electrician. So true Gary. You’ll never regret using a professional for important issues like these. Thank you so much for posting this information, I have lived in an apartment that had these for quite some time but I didn’t know what they were for, if something broke I called maintenance but now that I have moved into my own home I figured I needed to know what these were so that I didn’t run up a huge service man bill, much appreciated. I think you should know When To Call An Electrician For Household Electrical Problems rather than attempt to play with electrical wires (and fire too for that matter). Maybe your lights flicker or an outlet doesn’t work. Should you call an electrician, or try to solve it yourself? We asked our master electrician here at AbleAir-1 to talk about a few of the most common electrical problems that homeowners encounter, and how to handle them. It’s not just the nation’s power grids that’s antiquated (well, in most cities, at least). The wiring inside many houses is also out of date, straining to supply our ever-growing collection of electricity-hungry appliances, lighting, and electronics. The circuits in these older homes weren’t designed to power the many gadgets of modern life. So it doesn’t surprise me that many people need an electrician to fix their household problems. We commonly work on homes with this issue in historical districts of downtown Phoenix where a rewire is required to update a home’s electrical capacity to keep up with today’s demand. I have been having some problems with light bulbs burning out at a high rate. I understand there can be various reasons for this, depending especially on how widespread the problem is in your home and whether the bulbs you buy are ideal for your situation. I even have some lights that are flickering or blinking. This represents a Poor connection somewhere along the circuit. Maybe it’s a main wire connection that’s the trouble. Hi Sheila. There are a few things that could be causing your problem. Give us a call and we’ll take a quick look for you. There are multiple points where an electrical problem can take place. The simplest way to self-test is to turn your main breaker off and back on; and see if that fixes it. also; if you have electric heat; you can try turning the heater on (or an electric clothes dryer or oven) – if that doesn’t work; then you know it is a general power problem rather than specific circuits not working. Another way to test a specific electrical issue is to use a voltage meter to see if there is power to the appliance or not. Is the switch you are talking about here the one that has a red and black button on it? I have often wondered what that was? Is this supposed to keep the breaker from throwing in the main breaker box? I have learned a lot from your post and look forward to seeing more helpful posts from you. You seem to know yor stuff and there is a lot you could teach. Yes, the funny looking switch is the GFCI that protects you when the hair dryer falls in the sink. As far as I’m concerned, common electrical problems in the home need to be on your watch list. Throughout the life of your home, you will no doubt come across issues with the plumbing, heating, electricity, and other aspects of home life. Some issues can be solved by you, the homeowner; others are entirely out of your grasp because they relate to the city’s power issues. We’re lucky here in Arizona. We don’t normally have to deal with power outages related to the power company. Most of the time issues like that are from storms or freeze. People might be surprised to learn that as many as 80% of power disturbances originate inside the home. While lightning, ice storms, high winds, trees falling on power lines, car-pole crashes, normal electric circuit operations – even birds and squirrels – cause their share of power disruptions, most disturbances are caused by the day-to-day operation of ordinary household equipment and appliances. The biggest culprits are electrical devices with motors that cycle on and off. True Glenda. The difference is that with lightning, many appliances and electrical devices can be ruined in a split second if not properly protected. In many cases, homeowners insurance won’t cover the damages leading to an expensive strike. Maintenance is another common task of electricians. 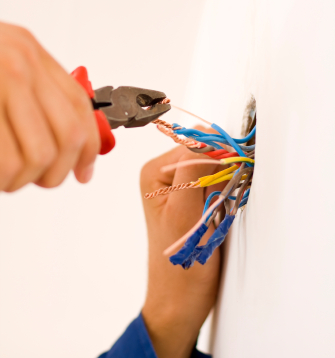 Electricians will visit businesses and homes to make any necessary electrical repairs. They in addition will install new wiring when needed, like adding power outlets or install extra lighting. From watching shows like “House Flippers, I know the renovation of older homes usually require electricians, due to the usage of additional electrical appliances, and the added power outlets needed to make these technological improvements. Yea, remodeling almost always involves moving wiring or relocating switches and outlets. Eagle Services works with all of the Valley’s remodeling contractors. It is something many homeowners may not think about much until there is an obvious problem. Your home’s electrical system is extremely important because not only does it provide comfort throughout the house, but also it can be a huge hazard if there is any kind of problems with it. Most people never think about their electrical system until something goes wrong. Dealing with an electrical problem can be most dangerous. True. Electrical troubleshooting is best left to an experienced technician. Thanks for your comment. I have noticed on several occasions that some lights get extra bright while others run dim. Bulbs may even be popping, and an electronic appliance or two may have died recently. This is a condition that will continue to be destructive to equipment in you home. It is from a Bad main neutral connection (or a bad neutral that is shared by just Two circuits). That could certainly be the cause. It could also be a surge related issue. We’d be happy to take a look for you. Any modern house contains a complex and interrelated system of electrical wiring, most of which is hidden within the walls. 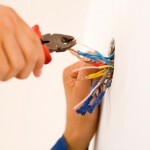 Finding an electrical problem, such as lights or appliances not working, is not an easy task. The problem must be narrowed down in some way to determine the root cause. I would not want to try and troubleshoot such a problem. I might electrocute myself or fry something. Good thinking. If a homeowner isn’t familiar with wiring and electrical troubleshooting, it’s best left to an expert. Give us a call if we can help.